Keen to have a unique and personal memento of your travels? Find out how with rapid drawing and painting techniques you can create something special. 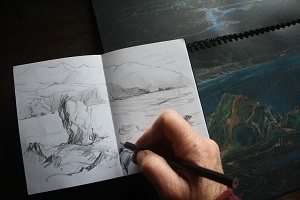 Compile a unique personal record of your travels and experiences with rapid drawing techniques and unobtrusive materials. We'll cover contour and tonal drawing, basic watercolour techniques and the use of coloured pencils. A list of materials required (approximate cost $60) will be sent out when course numbers are confirmed.